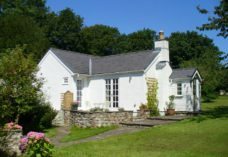 Tŷ Pwlldu (www.greatgowerholiday.com) is a lovely 4* graded terraced house, quietly situated on a lane that leads to the unspoilt bay of Pwlldu and the Gower Coastal Footpath. Pwlldu (Welsh for Black Pool) is a beautiful, secluded bay with a history of smuggling and is a haven to walkers, artists and nature lovers and is considered by many as Gower’s best kept secret. The Post Office / grocery store (where you can make free cash withdrawals) is just a few doors down from the property and serves the immediate local community, making this charming little house a great base to enjoy Gower. Both Brandy Cove and Pwlldu Bay are off the beaten track, but within fairly easy walking distance of 10 to 15 minutes from the house. There are also 3 excellent local pubs, one of which is a real ale pub and another a gastro pub, within 5 minutes walking; both of which serve excellent pub food. A Coop supermarket is situated in the centre of the village. The popular blue flag beaches of Langland Bay and Caswell Bay can be very easily reached by car within 5 minutes in one direction, whilst Pennard and Three Cliffs are a 10 minute car ride in the opposite direction. Mumbles, a small Victorian fishing village, is a 10 minute drive away. There you will find a variety of excellent restaurants, boutique clothes shops, quaint little gift shops and sporting facilities ….. ideal for browsing and shopping. The City of Swansea with all a modern city has to offer is 6 miles away. The cosy lounge is light and airy and comfortably furnished with 2 leather sofas and other occasional furniture. There is a large TV with flat screen. First floor: there is a double bedroom and a twin bedroom. The family bathroom has a bath with shower attachment above, wash hand basin and a WC. 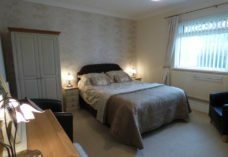 Second floor: a beautiful, brand new large double bedroom, with Juliet Balcony and en suite facilities. Flat screen TV with built in DVD. External: there is a south facing enclosed rear garden with patio and garden furniture and access to the rear entrance of the property, where you can usually park directly outside. There is also very good parking to the front of the property. C/O day – Sat. Gas CH. Bed linen & towels provided. WiFi. Travel cot & highchair. Enclosed garden. No pets sorry. No smoking. We thoroughly enjoyed everything about our stay at this property, and the whole area. The house was warm and very comfortable, with constant hot water and a good wifi connection.We stayed during cold, bright weather and were therefore not able to use the nice decking area at the back of the house. Luckily the sun shone for four days! which has an en suite and walk in dressing room. The kitchen is really well equipped. The area is peaceful and quiet. The local pubs have good food, which we enjoyed three evenings in a row. Madeline was extremely helpful when we first arrived, and told us all we needed to know about the area. We discovered Verdis Cafe on the seafront in Mumbles, which is also worth a visit. We also enjoyed Cafe Zinco in Swansea, which is a Boho style cafe with the most exceptional warm croissants and a lovely interesting room to sit in. Braclet bay is very pretty and scenic. We loved the Dylan Thomas exhibition (free) and also went to the Waterfront Museum. The Gower area is breathtakingly beautiful, and you musn’t miss a trip to Rhossilli bay. We also enjoyed a cream tea in Oxwich bay. A thoroughly commendable visit, in a lovely property and an interesting area. We’d love to come back! Have special requirements? Call Maddy Adams on 07759 795940. 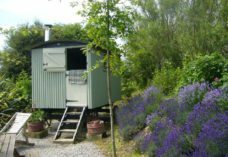 Tŷ Pwlldu is available for weekly letting, and short breaks of 3+ nights. Also, longer lettings. Short breaks are only accepted outside of peak season, unless there is a last minute availability. Changeover day is usually Saturday with guests able to arrive from 2.30 pm arrival. The property must be vacated by 10.00 am on the day of departure. BOOKING CONDITIONS: Bookings made by telephone or e-mail are firm provided they are confirmed within five days with a deposit. PAYMENT: Deposit of 50% payable with confirmation of booking. Balance to be received at least 4 weeks before arrival. Late bookings (within 4 weeks) to be paid in full on confirmation. Payments can be taken via Paypal, bank transfer or personal cheque. If you have to cancel the booking for any reason we will always try to arrange with you an alternative date using the deposit that you have already sent. If you are unable to do so, we will return the deposit, minus a £50 administration fee if we can re let the property. If for any reason you need to leave during your stay before the end of your booked dates we require full payment before you leave. Again, if we can re let the property we will refund you, minus the administration fee.